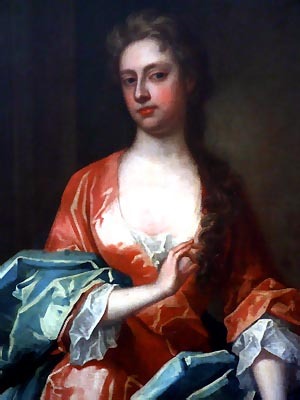 Sarah was the daughter of a Hertfordshire gentleman, Richard Jennings of Sandridge by his wife, Frances Thornhurst, and became Maid of Honour to Mary of Modena, Duchess of York and, afterwards, Queen of England & Scots. In 1678, she married the rising young soldier, John Churchill, who loved her passionately and was governed by her, absolutely, until the day of his death. Sarah, very early, became the especial friend of the dull and discontented Princess Anne. It was she who, in 1688, won Anne over to the cause of the Glorious Revolution and it was probably her influence which moved her Tory husband (whom King James II had loaded with favours) in the same direction. From the date of Anne's marriage, 1683, began the series of letters between the Princess and the Lady Churchill under the assumed names of 'Mrs. Morley' and 'Mrs. Freeman'. From that time until 1703, there was no cloud upon this remarkable friendship which, one would think, must have bored the witty and high-spirited Sarah considerably. Her only son died in boyhood, in 1703, and her eldest daughter, Henrietta, married the son of Lord Godolphin. Her second daughter married the son of Lord Sunderland, her third married the Earl of Bridgwater and her fourth the Duke of Montagu. Meanwhile, Sarah became, at Anne's accession, Mistress of the Robes, Keeper of the Privy Purse, Ranger of Windsor Great Park and, soon afterwards, a Duchess. What is more to the point, she also showed strong tendencies to become a Whig and to move her husband into the same political sphere. Quarrels with the Tory Queen were the natural result, yet the Duchess continued to show great favour to her bitterly Whiggish son-in-law, Sunderland, whom she at last succeeded in forcing upon Anne as Secretary of State in 1706. This was the beginning of the end and Anne's favour was gradually transferred to Abigail Hill, Mrs. Masham, a relative of the Duchess, who had, in fact, introduced her to the Royal Court. Queen Anne was evidently frightened of Sarah, who did not scruple to use strong and, indeed, inexcusable language to her. The last interview between this strange pair of friends took place in April 1710 and, early the next year, Sarah was dismissed from all her offices. When, in 1712, her husband was also dismissed, she followed him to the Continent and only returned with him to England upon Anne's death. Sarah spent most of her life at the Great Lodge (now Cumberland Lodge) in Windsor Great Park, a house she had coveted long before her appointment as the Park Ranger. She also spend a little time at Marlborough House near St. James' Palace and Wimbledon Manor. After her husband's death, in 1722, the Duchess was also busy completing the hideous structure of Blenheim Palace and she had a long series of spirited quarrels with most people around her, including her architect, her family and the King's ministers. She left, by her will, a legacy to William Pitt, afterwards Lord Chatham, probably because she believed him to be the re-incarnation of her own spirit of opposition and pugnacity.